Butanol is the go-to industrial solvent for products such as lacquers and enamels, but it might also play a substantial role in the production of renewable fuels. Gallon for gallon, it has 30 percent more energy than ethanol and only around 4 percent less energy than a gallon of petroleum-based gasoline. Agricultural Research Service chemical engineer Nasib Qureshi has studied a range of feedstocks for producing “biobutanol.” His most recent work suggests that using barley straw and corn stover—both agricultural byproducts—could be the answer. “To produce butanol most economically, we will need to produce it from agricultural byproducts, not from dedicated crops,” says Qureshi, who works in the ARS Bioenergy Research Unit in Peoria, Illinois. Qureshi has confirmed that both materials can be converted to butanol via “separate hydrolysis, fermentation, and recovery” (SHFR) or by “simultaneous saccharification, fermentation, and recovery” (SSFR). SHFR requires two operations in two reactors—one for hydrolysis and the other for fermentation combined with recovery. In SSFR, releasing the plant sugars, fermenting them to butanol, and recovering the butanol are combined into a single operation that is performed in a single reactor. In one recent study, Qureshi, ARS chemist Badal Saha, and ARS microbiologist Mike Cotta evaluated the effectiveness of SHFR in fermenting barley straw plant sugars into butanol. They pretreated the barley straw to release the plant sugars, which created a broth called a “hydrolyzate” that could be fermented into butanol. Then the researchers observed the hydrolyzate’s fermentation rates. They also used a process called “gas stripping” to remove the resulting butanol simultaneously produced during fermentation. With this approach, Qureshi and partners obtained a final butanol yield that was 182 percent of the yield obtained from a control study. Next, the scientists used the same protocols with pretreated corn stover and were able to ferment more than 99 percent of the sugars in the hydrolyzate. This resulted in butanol yields that were 212 percent greater than yields observed from the controls, and 117 percent higher than the butanol yields from the barley straw. Qureshi and his research partners applied these results to another investigation that evaluated the effectiveness of producing butanol from corn stover in an SSFR process that used vacuum technology—not gas stripping—to simultaneously recover butanol during fermentation. The team included Saha, Cotta, ARS molecular biologist Siqing Liu, University of Illinois professor Vijay Singh, and Ohio State University professor Thaddeus Ezeji. During the hydrolysis process, more than 97 percent of the stover sugars were released and were available for fermentation. The total butanol yield was 0.34 grams per liter per hour—higher than the glucose control yield of 0.31 grams per liter per hour. The scientists published their results in Bioresource Technology and Food and Bioproducts Processing, both in 2014. “Several years ago when I tried to ferment butanol from barley straw, the yields were much lower than the control yields, and I was not able to obtain any yields from corn stover,” Qureshi says. “So we’re pleased with our findings, and we look forward to scaling up and commercializing butanol biofuel production from agricultural residues such as barley straw and corn stover.”—By Ann Perry, formerly with ARS. 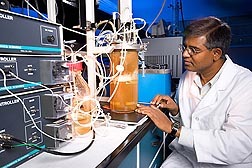 Nasib Qureshi is in the USDA-ARS Bioenergy Research Unit, 1815 N. University St., Peoria, IL 61604; (309) 681-6318. "Closing In on Butanol for Biofuel" was published in the November/December 2014 issue of Agricultural Research magazine.